Lock in a great price for Artis Centrum Hotels – rated 8.8 by recent guests! The location is excellent just behind the presidential palace and near to the Cathedral square and the town hall and there are many restaurants and cafe's nearby. The breakfast was good. The shuttle from/to the airport was a great service. The room was clean. Nice to have a pool with a small sauna available and a small gym. The restaurant food was good. The room was comfortable and it has a good wardrobe, safety box and a mini-bar. The location was perfect, food and the accommodation as well, plus the spa center was excellent. Best place value for money. Excellent location. Superb breakfast. Very comfortable beds and pillows. The bed was really so comfortable, didn’t want to leave it 😊 And the Hotel and the room was silent. It’s just a great plus. Excellent option if you want to do business and remain in the heart of Old Town. Very good conference facilities with a large choice of conference rooms which is a rare case for the Old Town. Location is super with huge variety of restaurants and places to go out. The location was wonderful, right in Old Town close to the Cathedral. The breakfast was excellent. Hotel was clean and safe. 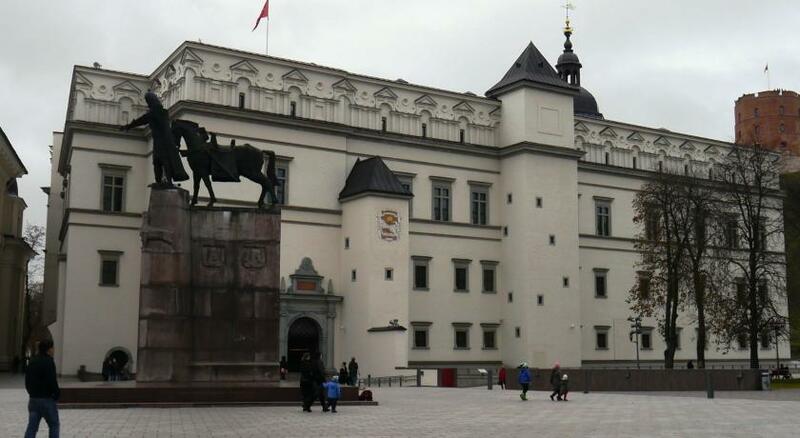 Lovely place, very close to the historical center of Vilnius. It's very easy to get around and there are lots of stores and great places to eat nearby. The room was spacious, bathroom was pristine and clean. Beds and shower were excellent. Breakfast was fantastic. I especially fell in love with blintzes stuffed with bananas (magical). The hotel was centrally located with walking access to most tourist attractions. The hotel had a bar and restaurant which I used the first night but found the prices a little excessive. The room was very comfortable with a large bathroom. Walking distance to restaurants, bars, etc of which there were many. Reception Staff were helpful on a number of occasions. The hotel is located in a great location with a friendly staff that all spoke English. The room was large with a 12 foot ceiling, beautiful moldings and a chandelier over our bed. Breakfast was perfect it had everything you could ask for to start your day. The only issue for this hotel was that the pool was cold. We had asked the staff about it and they said many guest have complained but management refuses to do anything about it. This is unfortunate because otherwise this would be a 5 star hotel for me but I would give it a 3 star rating because of the lack of action on such an obvious problem. Artis Centrum Hotels This rating is a reflection of how the property compares to the industry standard when it comes to price, facilities and services available. It's based on a self-evaluation by the property. Use this rating to help choose your stay! 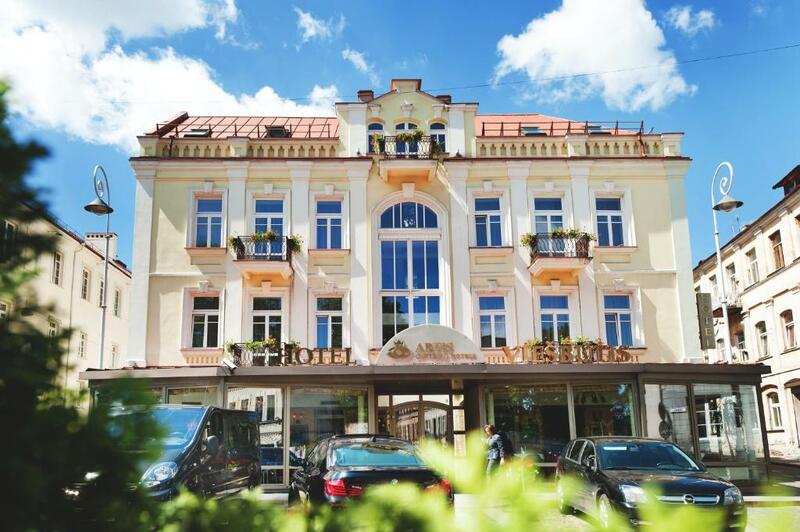 One of our top picks in Vilnius.Located in the center of Vilnius’ Old Town, Artis Centrum Hotels is set in a renovated building from the 19th century. An indoor pool and elegant, air-conditioned rooms are on offer. 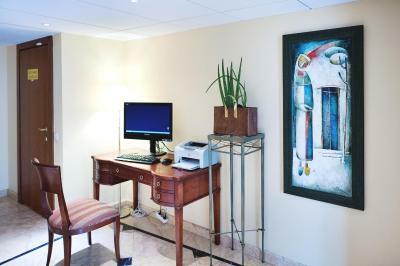 All rooms at the Artis are elegantly furnished. 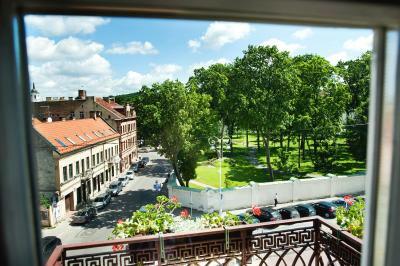 Guests can enjoy views of the Old Town and of Gediminas Tower. Satellite TV and free access to WiFi are also provided. Breakfast and lunch are served in the La Traviata restaurant. The second restaurant and bar, Adelia, offers a selection of European dishes and drinks. Guests can relax in the on-site whirlpool bath, sauna and steam bath for free between 18.00 and 21.00. In the spa center massages, beauty treatments, manicure and pedicure are available at a surcharge. The use of a fitness room is free for hotel's guests. Front desk staff is available 24 hours a day. Artis Centrum Hotels is located within walking distance of all major sights. Vilnius International Airport is 4.3 mi away, the main train and bus station 1.2 mi. 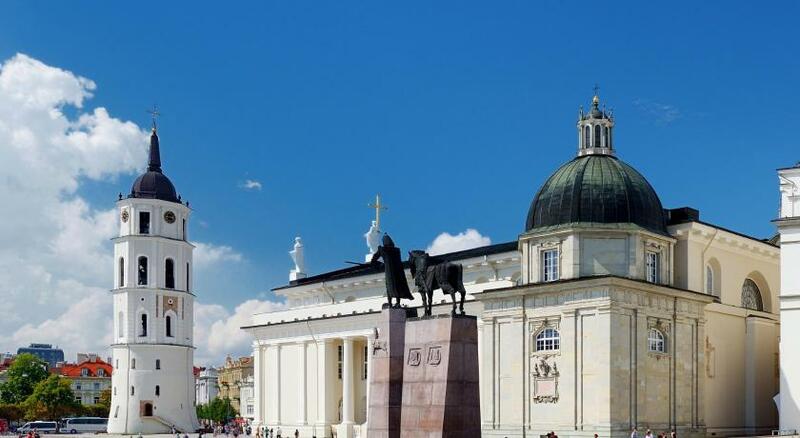 Vilnius Old Town is a great choice for travelers interested in churches, architecture and history. When would you like to stay at Artis Centrum Hotels? Air-conditioned room with a large flat-screen TV and a safe. Large, air-conditioned suite with a large flat-screen TV, a safe and a separate living room with a sofa. Bathroom comes with a shower and a bath, free toiletries, bathrobes and slippers. This suite features a mini-bar, electric kettle and air conditioning. Bathroom comes with a shower or a bath, free toiletries, bathrobes and slippers. Air-conditioned, spacious room with coffee/tea facilities and complimentary mineral water. 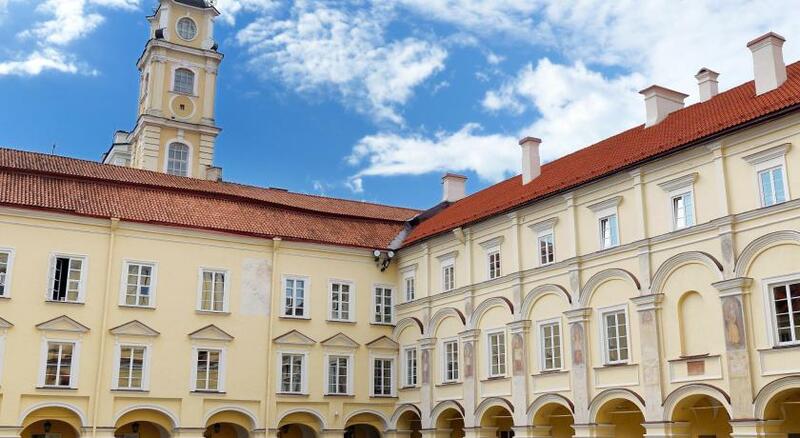 Subtle and elegant four-star plus hotel with unprecedented hospitality is situated in one of the most exceptional areas of Vilnius Old Town. Surrounded by the main streets, destinations and cozy cafes. Hotel surroundings – This neighborhood is a great choice for travelers interested in churches, architecture and history – Check location Excellent location – show map Guests loved walking around the neighborhood! House Rules Artis Centrum Hotels takes special requests – add in the next step! Artis Centrum Hotels accepts these cards and reserves the right to temporarily hold an amount prior to arrival. Great place, good breakfast, nice rooms and wonderful spa with sauna, steam bath and jacuzzi. The breakfast was good but included the same every day, I would appreciate at least few new different items daily. The matrix was terrible, I could feel the springs, for a hotel with 4 stars I was expecting a better bed and not a cheap one. The air conditioner was noisy and only released heat when I was trying to get a lower temperature. The restaurant it was expensive and with few choices on the menu. The room card key stop working in contact with my mobile phone. The pool and the sauna were only allowed to be use on a restrict schedule, that's unfair and it was not mentioned on the web site. The location was fantastic. I stayed here with 10 friends (11 of us in total), we booked six twin rooms and they located us all on the same floor pretty close together. The location was fantastic; very central. Although Vilnius is quite small anyway, so I not difficult to get to most places on foot anyway. We had organised a few trips, all of which picked us up from the hotel. Good food and drink very close by, as well as coffee and shops. The breakfast which was included in the price was decent (not amazing, but good) and served at a reasonable time (7 till 10 weekdays; 8 till 11 weekends). The pool opens only in the morning and evening and includes access to a sauna and steam room; although I'm still not sure if the morning is for prepaid booking or not (I nipped in anyway and had the pool and sauna to myself, which was nice). Overall, I really enjoyed my stay. I would recommend this hotel to anyone! Can be a little noisy. The atrium leads to sound echoing. This hotel is really located in the central of old town! The whole design in hotel and room are very elegant and unique. The room is very clean and comfortable. We enjoy the swimming pool and steam, Susanna rooms after walking whole day! Perfect location, super friendly and helpful staff, comfortable bed, rich and delicious breakfast. Would stay there again. I would like to have more equipments in the gym like orbitrek. The reception staff wasn't able to give the best information about transfer from Vilnius to Kaunas airport. In particular, they did not let me know about Ollex van transfer departing from Seinu. Street. Almost everything. One of the nicest hotel. Large and comfortable room, good location. Great deal. Carpet in room. Spa not any more uptodate standards.